Pippa Wilson tells us the story of Zaci the Zebra, Jabalini Giraffe, Eevie Elephant, Lado Lion and some other baby animals that have decided to go out in a big adventure. Unfortunately, Maamuni Monkey has also joined the group and he has guided them to a scary, forbidden place. When no one knows what to do, Zaci steps up to the challenge and takes the lead to get everyone home safe. Young readers will learn to remain close to their parents in unknown places and also to stay calm if they happen to be lost. The book is written in verse and has attractive illustrations. Recommended to teach a gentle lesson to a young one who tends to run away in public places. 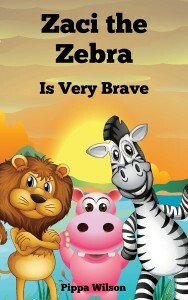 You can find “Zaci the Zebra is Very Brave” and other books from Pippa Wilson in Amazon. You can also read more about Pippa Wilson at her website. This entry was posted in Children books, Rhymes, Uncategorized and tagged Pippa Wilson, Zaci the Zebra on September 27, 2014 by Jose Luis Cortes.